If you want something elegant, this is the perfect dessert! Make it for your valentine or for any special occasion. The recipe is really a combination of three easy parts. Layer them together and you’ve got dessert perfection! Sweet, tart, smooth and creamy with a bit of delicate crunch– this dish has it all! It’s tasty, beautiful and easy to prepare. The lemon mousse is a soft blend of whipped cream and sweet-tart lemon curd. You can take a short cut and purchase lemon curd (available at most supermarkets near the pie filling). The raspberry sauce is fresh and flavorful, and the meringue kisses add an unexpected touch and really make this dessert pop! 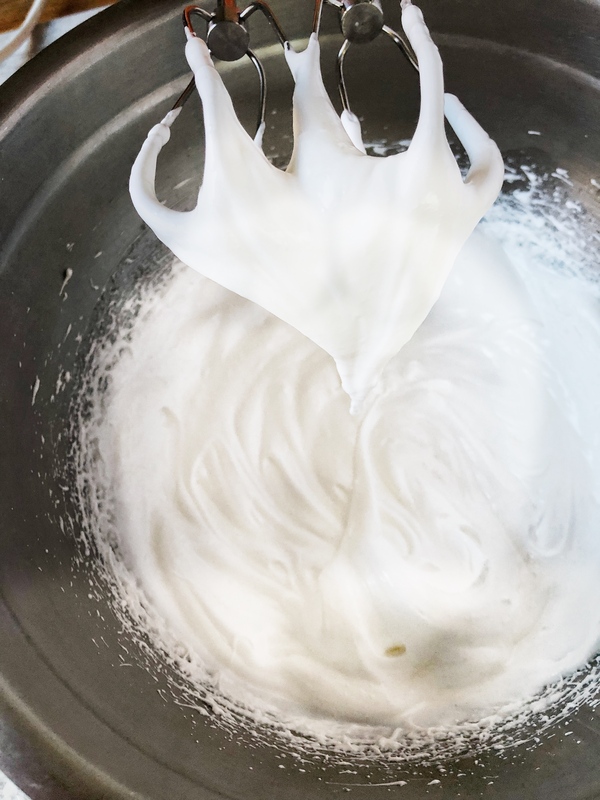 To make the meringue kisses, whip the egg whites and sugar with an electric mixer (unless you prefer a good arm work-out with a whisk) until soft peaks form. Then continue mixing. When the meringue is glossy and peaks hold their shape, stop and fill a pastry bag fitted with a star tip. Pipe little star swirls (about the size of a quarter) on a parchment lined baking sheet. You will bake these at 250 degrees for 30 minutes then let them sit in the oven (don’t open the door) for 1-2 hours more to dry out. 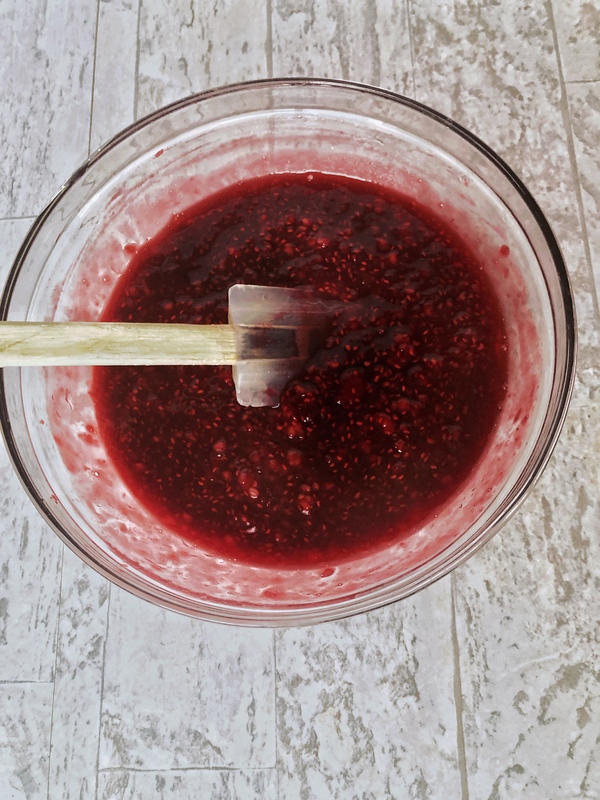 The raspberry sauce is a simple blend of raspberries, sugar and water. You can choose to keep the seeds or strain them out. I don’t mind a few seeds, so I’ve chosen to keep them in. We’ll all know there are real raspberries in the sauce! The lemon mousse starts with fresh whipping cream. Just whip then chill it while making the lemon curd. You can prepare the lemon curd in a mixing bowl set over a sauce pan of simmering water, or make it in a heavy-bottomed sauce pan. Cut the butter into small chunks so it well melt faster into the lemon curd. Once the lemon curd has thickened, chill it. Then softly fold it into the cold whipped cream. Try to preserve as much air in the cream as possible. When finished, the Lemon Mousse will be a pale yellow. Chill it until you’re ready to assemble. 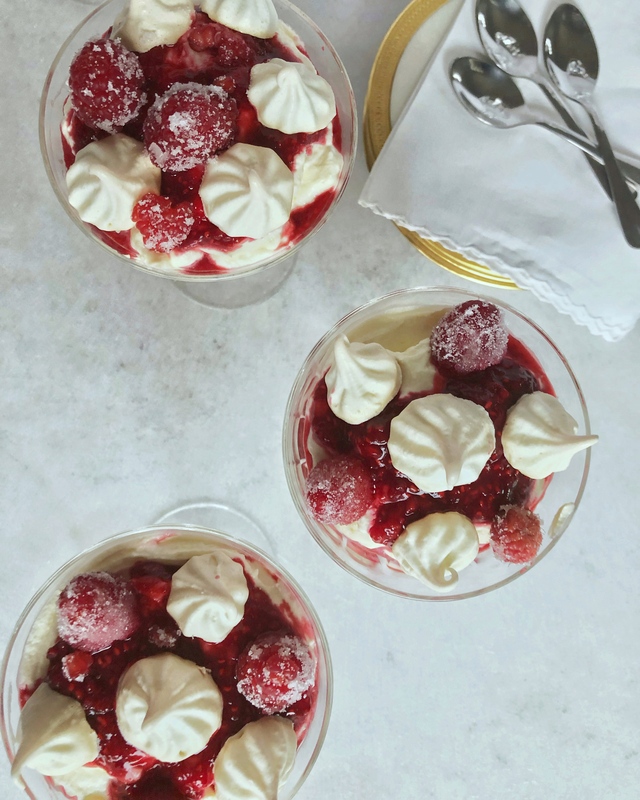 To assemble, layer lemon mousse, then raspberry sauce, and repeat. Carefully garnish with meringue “kisses” and raspberries. If you’d like sugared raspberries, you can simply roll them in white sugar. They add a magical touch to this graceful dish. In a large room temperature mixing bowl, beat together egg whites and sugar with an electric mixer. Mix until sugar dissolves, then beat mixture with mixer on medium-high 3 to 5 minutes or until glossy, and stiff peaks form. Transfer mixture to a pastry bag with a star tip. Pipe small round "kisses" (swirls or stars) on a parchment paper lined baking sheet. In a medium saucepan combine sugar and raspberries. Bring to boil, stirring frequently; reduce heat and simmer, about 10 minutes or until slightly thickened; let cool. Press raspberry sauce through a strainer to remove seeds (optional). Chill, cover until ready to assemble (up to one week). In a large bowl beat cream and powdered sugar until soft peaks form. Whisk together eggs, egg yolks, and sugar for 2 minutes until the mixture is pale yellow. Whisk in cornstarch and salt, making sure there are no lumps. Whisk in lemon juice, water, lemon zest, and melted butter until fully incorporated. Pour mixture into a saucepan and place over medium heat. Whisk mixture continuously for 7 minutes, scraping down the sides every 30 seconds or so. The mixture should deepen in color and become very thick. Remove from heat and whisk for 1 minute more. Pour in bowl; wrap in plastic wrap and chill in fridge for 1 hour. 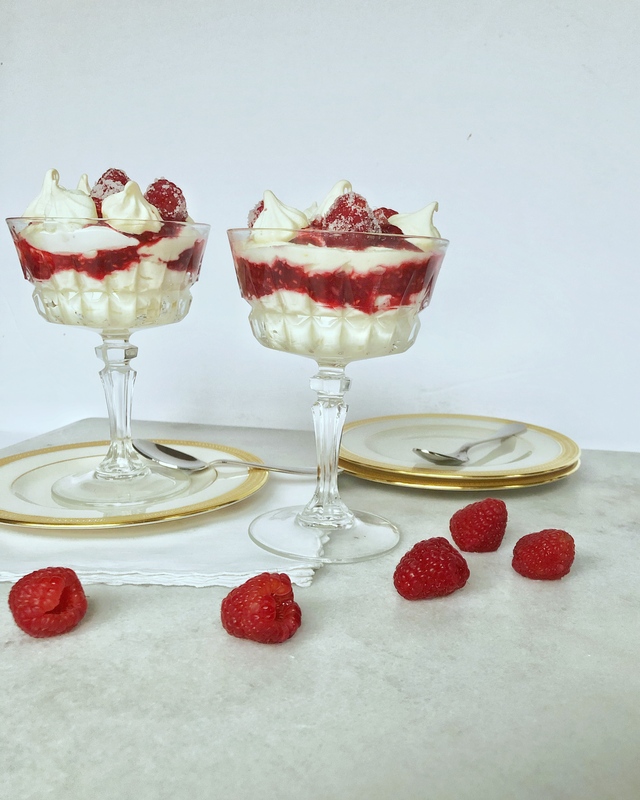 Layer lemon mousse and raspberry sauce in bowls or glasses; repeat layers. Garnish with meringue kisses and raspberries rolled in sugar. Serve immediately or refrigerate and serve within 2 hours.